The revolutionary citizens called the Indigenous People of Biafra (IPOB) who is championing a peaceful and non-violent struggle for the restoration of the Sovereign State of Biafra was recently branded a terrorist organization by the Islamic State of Nigeria led by President Muhammadu Buhari as soon as they kicked off their second phase of total revolution. Indeed, evil always wrestles against the light. After brandishing IPOB, a terrorist organisation, world leaders frowned against the action by the Federal government and also raised obnoxious statements against the government in condemnation of the terrorist tag on indigenous people, reason being that the conducts and modus operandi of IPOB whose leader is Mazi Nnamdi Kanu, do not fall in the prescribed requirements of a globally-recognized terrorist organization. This is a people-oriented movement that has received recognition and accolades from Amnesty International, a well renowned human rights group in the world, for being well-mannered and peaceful than any other freedom fighting outfit in the world. 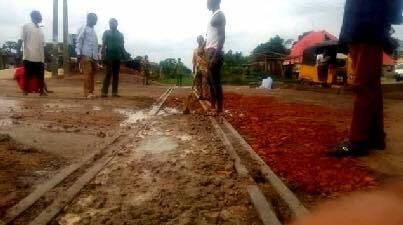 Prior to the terrorist tag on IPOB, her members had embarked on a road construction in Biafra land. Over the years, the Nigerian government neglected the Biafra region not considering or carrying out any infrastructural development in the region thus resulting to dilapidated roads in major places. This, in effect, has badly affected lives, caused series of fatal accidents, and at same time, crippled businesses in the region. This is a region blessed with the finest merchants and entrepreneurs ever known to man but due to the nature of the roads, their success, development and wellbeing have being narrowed down to zero. What kind of a terrorist group build roads for the people? I think the Nigerian government should answer that simple question. They should hide their face in shame for such a childish and treacherous move of tagging a race terrorist. It’s now clearer that power breeds corruption, exploitation, intimidation and subjugation in a mad man’s heart. This high snub by the Nigerian government over the people of Biafra can be seen as a deliberate move to keep the people in perpetual darkness, misery and marginalisation. No doubt, the proscription of IPOB and designation as terrorists, is their last check to keep the status quo. A lot of utterances flooding in from the Northern (the subjugators) part of Nigeria are there to back up this gross wickedness meted on the people of Biafra. Nasir El-Rufai, the governor of Kaduna state in northern Nigeria recently made it open that the Northerners are not equal with the Biafrans and as a result, cannot be treated equally. On 21st December 1967, in New York Review, Dr. Conor Cruise O’Brien reported that he heard remarks from the northerners saying that all Nigeria’s ills will be cured once the Biafran people have been totally exterminated from existence. 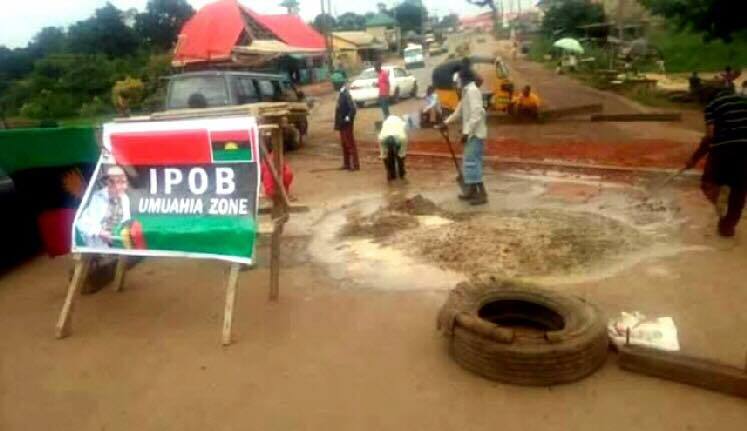 It is apparent that one of the reasons for the terrorist tag on the peaceful people of Biafra is to drive them away from constructing their roads in order not to rejuvenate the region and most especially, to achieve their long aged dream of extermination of Biafrans. Amidst all these, crude oil which is Nigeria’s economic mainstay and surviving factor in Nigeria is from Biafra land. As it is said that he who is rejected by the people does not have to reject himself, Biafrans through the revolutionary IPOB, took it upon themselves to build and rehabilitate their roads in Umuahia, Abia State without the aid of the Nigerian government so as to make life easier for their people. Work was in serious progress until the Nigerian government came with their terrorist tag in order to disorganise and put a stop to that angelic idea which would have cured the people’s ills. This would have brought about the rejuvenation of the people of Biafra whose lives have been a calligraphy of agony and mosaic of misery. With the good societal prospects of IPOB fighting for the independence of the Sovereign State of Biafra, one can see freedom conceived for the people. One can perceive liberation in the protruding belly of the Sun. This time, it will come to light and the evil night will soon end. For the truth that is banished today by the Angel of death, shall one day sit on the throne and glorified on the mountain top because the triumph of the evil is as perennial as the grass. Here comes the dawn of new days filled with oasis of fortunes. The genuine works of IPOB are there for all to see. IPOB is the hope of all who are in misery and subjugation. One could hear the embattled land rejoicing then, chanting with lamentation, crescendos and diminuendos reverberating as IPOB was healing it. Biafrans wait, very soon I say very soon, the Nigerian government shall roll their tanks away and then these good works shall commence in fullness. This can be achieved only if Biafrans are able to follow the commandments of IPOB in totality. I see a freedom force in the Sun, indeed the Sun is protruding. Remember Biafrans, flowers do not emerge from diamonds but from manures and so, out of this rotten situation of the Biafran people, a rose shall soon blossom.